I’m always looking for ideas for easy low carb meals. And, one of the most common recipe requests I get is for quick keto meals. So, I was thinking that it was about time to create a resource on the topic to share with you. As a food blogger, some people think that I am constantly cooking these elaborate recipes. When we go out to eat, well-meaning friends or family members will occasionally ask me if I’m going to “make something similar for the blog”. For some reason, the question comes up more if we happen to be eating something unusual or relatively complex. That couldn’t be further from the truth! I have two little kids and essentially two full-time jobs. I don’t have time for elaborate recipes. I’m all about the quick and easy keto meals. Even if your day-to-day scenario is different from mine, we are all short on time. 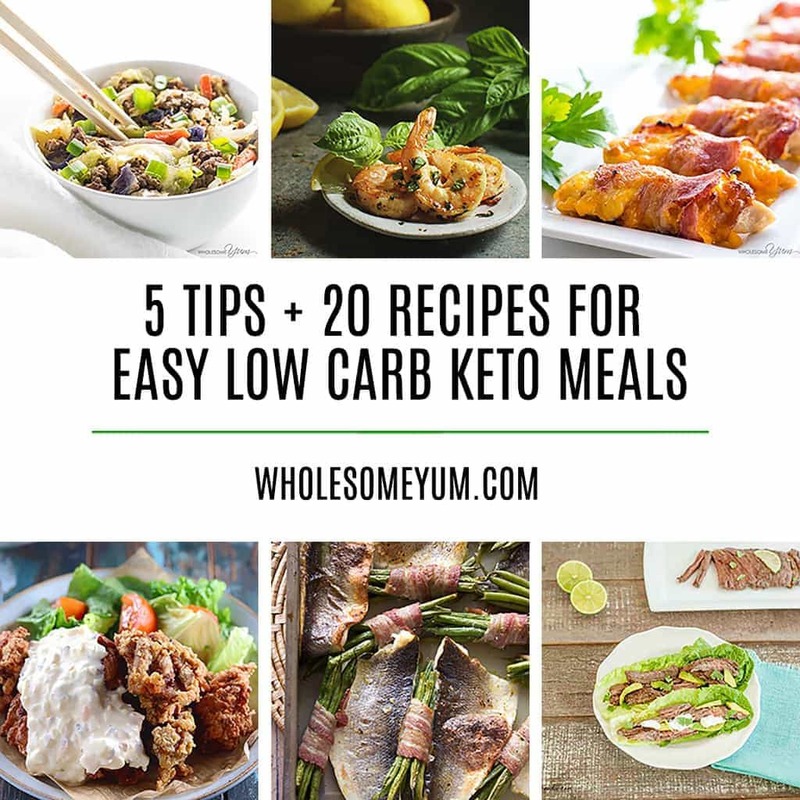 And, we could all use some easy low carb recipes to make life easier. Dinner at our house is hardly ever complicated. It’s usually one of my favorite quick keto meals. Or if I’m lucky, it’s one of the easy low carb meals I’ve stashed in the freezer. Plan your keto meals. I know it’s a little extra work upfront! But, it pays off in spades when you are not stuck staring at the fridge at 6pm wondering what is going to be dinner. I use a simple spreadsheet and enter it there. Others like pen and paper. Keep it simple and do whatever is easy! You won’t stick to it if it’s not easy. If you are new to planning, start with just dinner. Lunches can often be leftovers. You can repeat the same thing a couple times in a week if you want to, which is more efficient. Many people do low carb meal prep on Sundays. This saves tons of time throughout the week when you can just grab your meal and go! In addition to individual containers, sometimes meal prep just making enough of something to last several meals. For example, you can bake a loaf of keto bread and use it for multiple things during the week. When you make your meal plan, don’t forget to check your fridge! That way, you can incorporate whatever you already have into your low carb meals for the week. This will save you money and reduce waste of throwing away food that went bad. When you look at the easy low carb recipes on this website, notice that the recipe cards all have a box for number of servings. Many other websites have this, as well. Go ahead and increase that serving count, because it takes almost the same amount of effort to make a double or triple batch of something! Then, freeze most of it. You’ll have an effortless keto dinner ready to go for another day. Shared Entrees for the Family. One challenge that I repeatedly hear about is how to cook healthy low carb meals for yourself when friends or family aren’t on board. It’s totally doable! You can make it easier on yourself by preparing a shared keto entree for everyone to enjoy. Many of them can easily be naturally low carb, anyway. Then, make a keto side dish for yourself and regular potatoes/rice/whatever for people that demand them. Also, people that are resistant will more readily accept keto meals that don’t have strange substitutes or ingredients. With time, hopefully they will join you and see the benefits of low carb, too. This article is primarily focused on quick keto meals for dinner, but many of the recipes can apply to lunch, too. And what about breakfast? Maybe more importantly, are there any quick low carb meal ideas that don’t actually require a recipe? Yes, absolutely! From stir fry to salad to throw-in-whatever-you’ve-got soup and more, there are plenty of ways to eat keto food without relying on a recipe or even going out to buy ingredients. To get you started, I’m sharing 20 of my favorite easy low carb recipes. And, many of them are versatile enough that everyone in the family can enjoy them. 1. 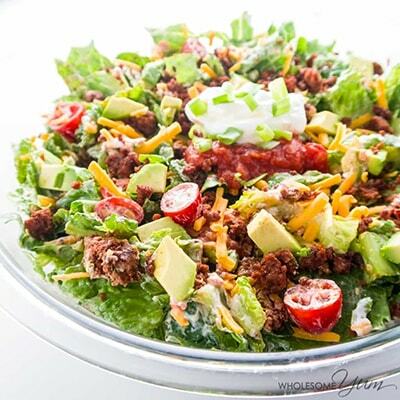 Easy Healthy Taco Salad with Ground Beef from Wholesome Yum – With only ten common ingredients, this salad brings all the best taco flavors into one easy, healthy meal. Low carb salads like this are super easy at the last minute, especially if you stash the meat in the freezer in advance. 2. 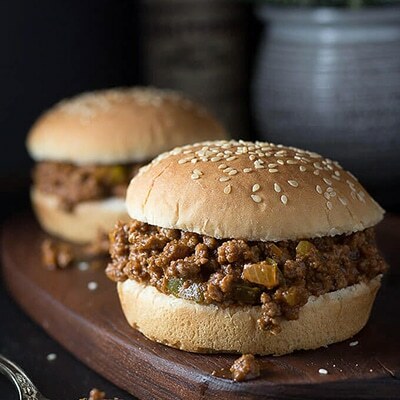 Homemade Low Carb Sloppy Joes from Low Carb Maven – There’s nothing like homemade sloppy Joes from scratch with a delicious sloppy joe sauce. Enjoy this low carb recipe on low carb rolls or in lettuce cups. And, this low carb meal is versatile so that you can serve it for family members that may not be on board with skipping carbs. 3. 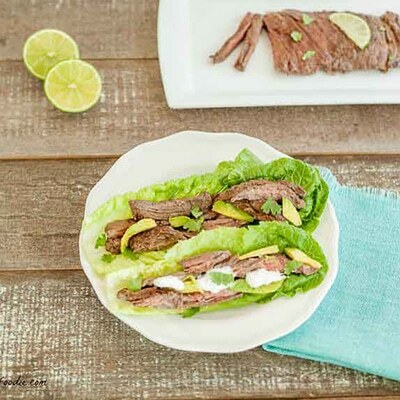 Easy Marinated Grilled Steak Tacos from Beauty and the Foodie – Easy to make, marinated grilled steak tacos are tender and full of flavor! They are low carb, super simple, and only have a few ingredients. 4. 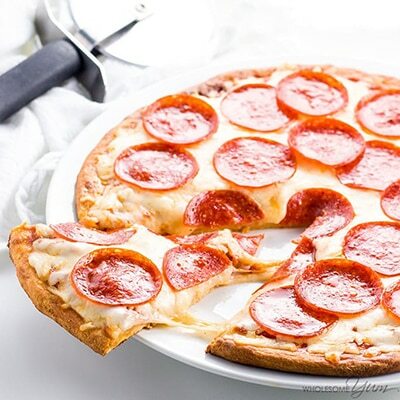 Keto Fathead Pizza Crust from Wholesome Yum – When it comes to easy low carb meals, it doesn’t get any better than keto pizza that tastes almost just like the real thing! And with just 4 ingredients, you’ll love how simple it is to make. 5. 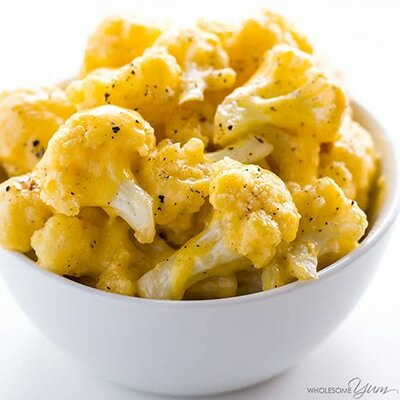 Low Carb Cauliflower Mac and Cheese from Wholesome Yum – Macaroni noodles aren’t necessary for this delicious take on mac & cheese! Who says quick keto meals can’t be comfort food, too? This makes a filling vegetarian option, or you can serve it as a side with something else. 6. 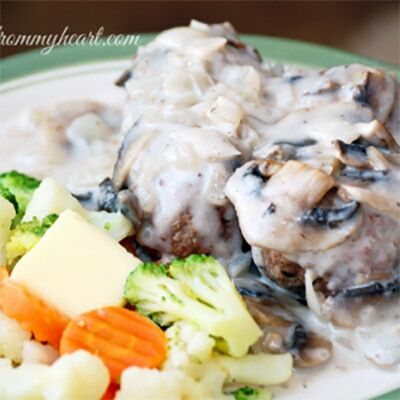 Paleo Meatballs with Mushroom Sauce from Whole New Mom – These tender meatballs with a creamy mushroom sauce may become a new family favorite, and the sauce is even dairy-free. Meatballs are a great make-ahead idea for low carb cooking. 7. 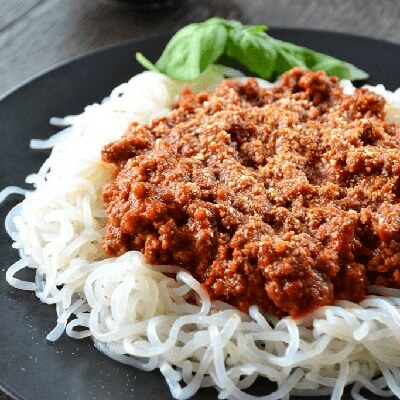 Keto Spaghetti Bolognese from Fat For Weight Loss – Keto Spaghetti Bolognese is a mix of delicious tomato based beef mince (ground beef) mixed with “miracle” noodles. This keto meal is a must-try! 8. 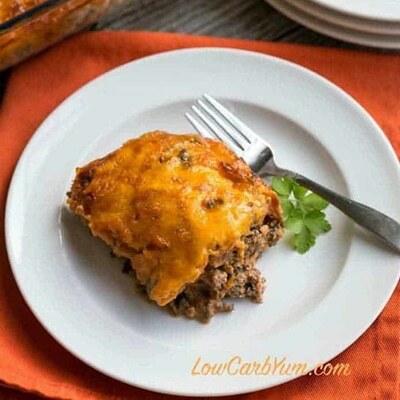 Low Carb Bacon Cheeseburger Casserole from Low Carb Yum – This easy keto casserole is the perfect low carb meal for sharing with family and friends. It tastes just like a cheeseburger! 9. 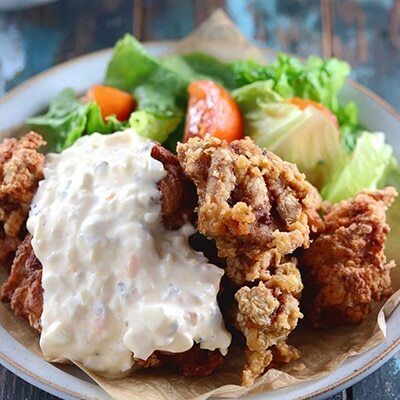 Keto Paleo Fried Chicken from My PCOS Kitchen – Delicious, tender fried chicken is easier to make than you think! If you miss crispy fried chicken on a keto diet, now you don’t have to. 10. 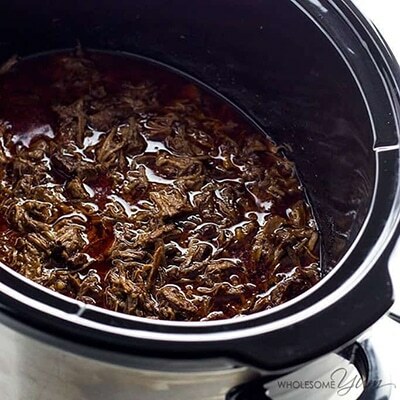 Chipotle Barbacoa in a Slow Cooker from Wholesome Yum – With just five minutes of prep, this recipe is a breeze. And, it will show even the most stubborn family members that quick low carb meals can be delicious! Serve it as a taco salad, in a low carb taco shell, or with low carb tortilla chips for nachos. 11. 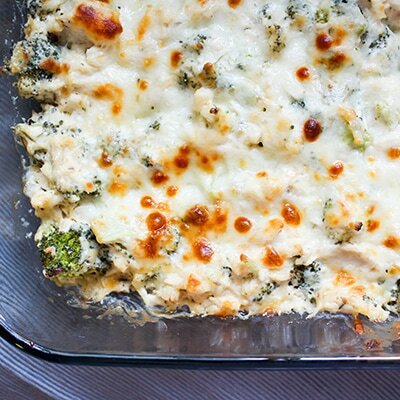 Cheesy Chicken and Broccoli Casserole from My Montana Kitchen – This cheesy chicken casserole takes just 15 minutes of prep and comes out delicious and comforting. Casseroles make some of the most versatile, cheap and quick keto meals. 12. Keto Air Fryer Tandoori Chicken from Two Sleevers – Make Keto Air fryer Tandoori chicken in your air fryer with just a yogurt-based marinade. A flavor-packed keto, low carb chicken recipe that is super easy to make and tastes like authentic tandoori chicken. 13. 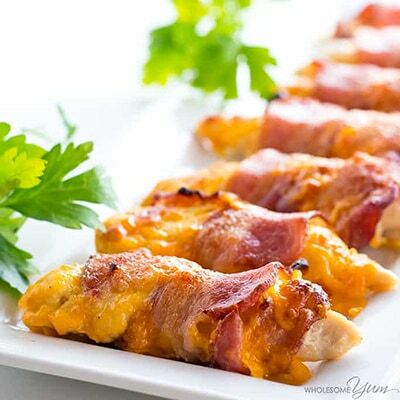 Baked Bacon Wrapped Chicken Tenders from Wholesome Yum – These cheesy bacon wrapped chicken tenders need only three ingredients that you probably already have. They are perfect for any busy weeknight, when you are looking for quick low carb meal ideas. 14. 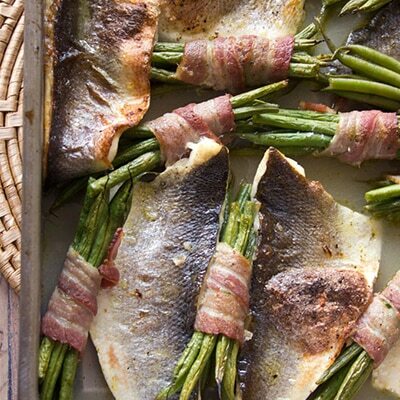 Roast Sea Bass Traybake from Sugar Free Londoner – This dish is quick and light, yet super impressive-looking! No one will guess how quick and easy it was. Fish sheet pan dinners like this one make convenient, quick keto meals. You can throw them together at the last minute. And if you don’t have sea bass, it would probably work with other fish, too. 15. 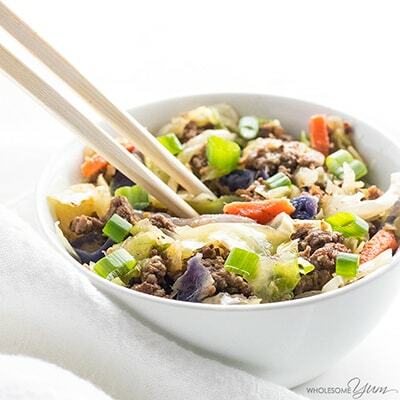 Low Carb Crack Slaw Egg Roll in a Bowl from Wholesome Yum – It doesn’t get any faster than 15 minutes! This heavenly dish takes just that long to make, and it’s so flavorful, too! It’s just perfect for throwing together on a busy weeknight. 16. 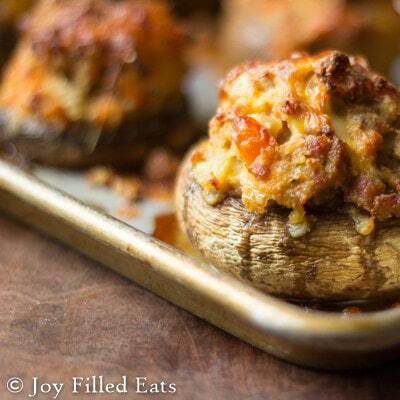 Mushrooms Stuffed with Sausage, Peppers, & Onions from Joy Filled Eats – Stuffed mushrooms are extremely easy to make and customizable with your favorite ingredients. With meat and veggies in there, these make perfectly tasty low carb meals on their own. 17. 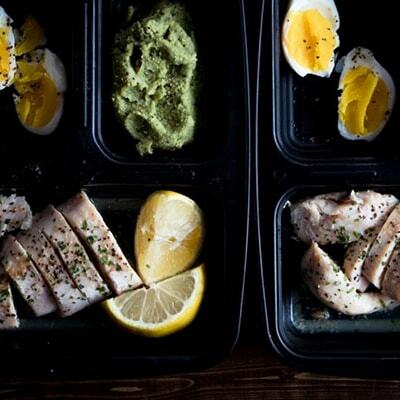 Chicken Breast Meal Prep from Ketogasm – Chicken breast is one of the best, most versatile ingredients to use for low carb meal prep. This recipe will guide you through the entire process. Your low carb lunch (or dinner) can be all set for the entire week! 18. 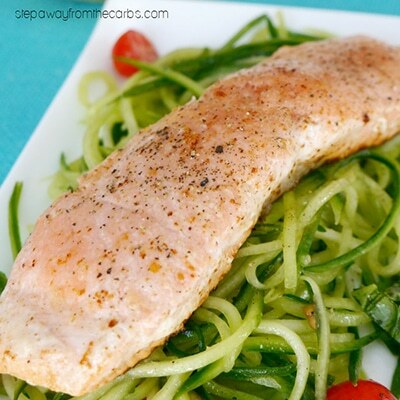 Butter Poached Salmon with Cucumber Noodles from Step Away From The Carbs – This delicious and easy dinner idea is a good example of why I love low carb 30 minute meals. You can’t go wrong with a combination of fish and vegetables. 19. 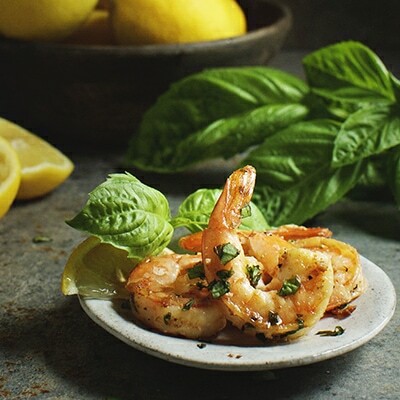 Easy Garlic Basil Shrimp from Simply So Healthy – When you’re tired of beef and chicken, but want more healthy low carb meals, try shrimp! With the delicious flavors of garlic and basil, this easy recipe takes seafood to the next level. 20. 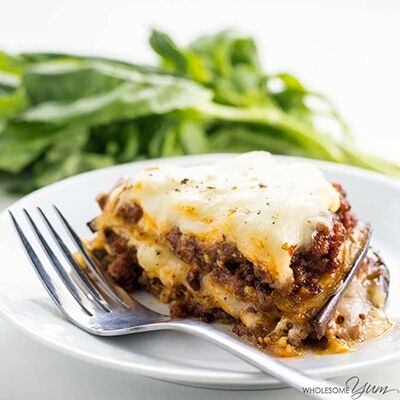 Eggplant Lasagna from Wholesome Yum – Try this healthy lasagna and you won’t even miss the noodles! It has all the comfort food aspects of real lasagna, without the carbs. And, you’ll be surprised at how easy it is. Incorporate it into your rotation of quick keto meals by stashing an extra batch in the freezer. OnKeto.com is a news aggregation service that brings you best of world articles to you for your consumption. Next articleGlucose Or Ketosis as Fuel, Which is better for weight loss?